The sublime film music, now-iconic situations (like the climactic ghost town shootout), and sure visual style add up to a pitch-perfect genre pic that ongoingly influences generations of hip filmmakers. 161 min. United Artists Films. Director: Sergio Leone. Cast: Clint Eastwood, Eli Wallach, Lee Van Cleef, Aldo Giuffre, Mario Brega. "Isn't three the perfect number?" So asks one of the unholy trinity in the ultimate “spaghetti western”: The Good, The Bad and the Ugly. Sergio Leone's epic vistas and intense close-ups (part and parcel of Tonino Delli Colli's brilliant panoramic photography)--matched with Ennio Morricone's dusty, twangy, wailing horse-operatic score--make for what may be the most indelible Western ever made. True to form, the ever-patient Leone begins the film with ten dialogue-less minutes, part of a half-hour initiation neatly establishing three main characters operating as independently as possible from the Civil War unfolding around them (depicted in impressive recreations, especially given a budget sizeable mostly only in comparison to Leone's other films to date). The "good"--and good is strictly relative--refers to Clint Eastwood's "Blondie," a gunslinging grifter with an individualistic moral muse that keeps him out of step with the lowlifes around him. The bad is assassin-for-hire “Angel Eyes” (Lee Van Cleef), who likewise has a code: kill and maim whomever it takes effectively to look out for number one. The ugly is Tuco Benedicto Pacifico Juan Maria Ramirez, a.k.a. “The Rat” (Eli Wallach), a brusque fool too impulsive ever to play it safe. The Good, the Bad and the Ugly was the apex for Eastwood's so-called "Man with No Name" character: a wry, laconic archetype who lives above the law, the lesser specimens around him, and the lifestyles that hem them in. As "Blondie"'s tentative partner, Wallach makes a brilliant foil, a survivor who knows almost enough to succeed as an outlaw ("When you have to shoot, shoot. Don't talk"), but not quite. Van Cleef launched a new phase of his career with the preternatual shrewdness and stillness of "Angel Eyes." With the film's poorly post-synched soundtrack, these drifters take on an extra roughness and a yet more otherworldy quality. Without belaboring any points, Leone's existential Western ruminates on man's inhumanity to man. At one point, Blondie sizes up the war: "I've never seen so many men wasted so badly." And an unpleasant family reunion between Tuco and his brother, a priest (Luigi Pistilli) considers the merit of two responses to poverty: is being a thief or a priest a saner response to the world into which they were born? With every man for himself but fatefully tangled up with the others, it's easy to pity Tuco, hiss the hard and dastardly Angel Eyes, and root for the self-amused centeredness of the "good" Blondie, though the men are driven by the same instinct of self-preservation. The sublime film music, now-iconic situations (like the climactic ghost town shootout), and sure visual style add up to a pitch-perfect genre pic that ongoingly influences generations of hip filmmakers. 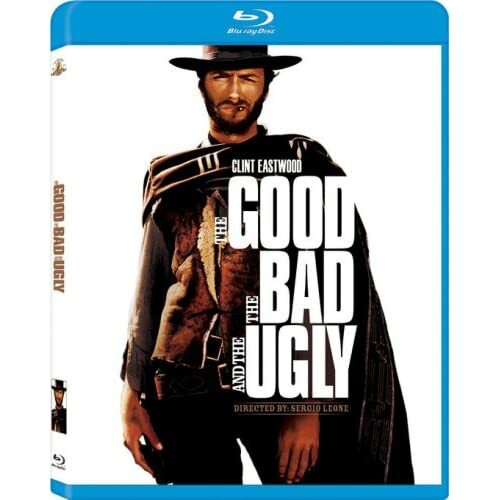 The Good, the Bad and the Ugly's 2003 restoration (with a run time of 179 minutes) gets further spruced up for Blu-ray in a fantastic A/V presentation. In brief, the film has probably never looked this good in any form. The 2003 restoration got the maximum information out of the source elements (borne of a cheap process called Techniscope that amounts to two side-by-side 16mm frames), and here, it's sharper than ever, with truer hues. No digital artifacts distract from a best-case scenario visual presentation. The DTS-HD Master Audio 5.1 mix is certainly very impressive, though like many "restoration" hi-def tracks, has been pumped up. Purists will be further dismayed to learn that the Dolby Digital mono track included is not the original audio but "fake" mono flattened down from the 5.1 mix (and what's the point of that?). Bonus features remain intact from the previous 2-Disc DVD edition. There are well-informed audio commentaries from film historian and Eastwood expert Richard Shickel and from noted cultural historian and Leone expert Christopher Frayling. Both tracks are well designed to enhance one's appreciation of the film. "Leone's West" (19:55, SD) and "The Leone Style" (23:48, SD) are two halves of one behind-the-scenes doc. It's a terrific program, with Shickel, English Language Version translator Mickey Knox, producer Alberto Grimaldi, Clint Eastwood, and Eli Wallach providing historical context and anecdotes illustrating the film's making and Leone's process. An excerpt from the full-length documentary "The Man Who Lost the Civil War" (14:24, SD), narrated by Morgan Sheppard, details the "Sibley Campaign" that inspired Leone. 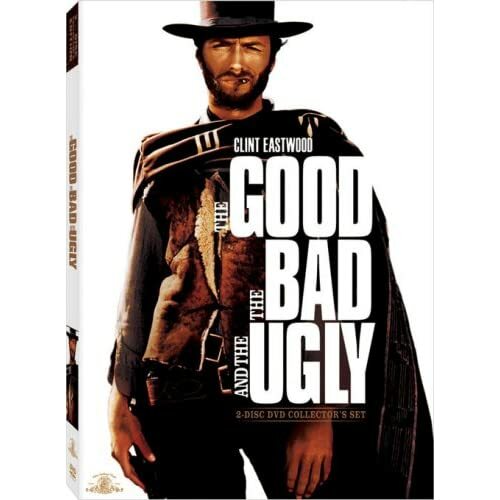 "Reconstructing The Good, the Bad and the Ugly" (11:09, SD) describes the process by which the 2003 restoration was completed. Participants include Wallach, Grimaldi, Triage Labs owner Paul Rutan, Jr., and MGM Director of Technical Services John Kirk. "Il Maestro: Ennio Morricone and The Good, the Bad and the Ugly--Part One" (7:48, SD) and "Il Maestro: Ennio Morricone and The Good, the Bad and the Ugly--Part Two" (12:26, HD) feature top film music historian Jon Burlingame discussing Morricone and his work on this film; the latter is solely an audio track. Two "Deleted Scenes" (10:19 with "Play All" option, SD) include "Extended Tuco Torture Scene" and "The Socorro Sequence: A Reconstruction," which uses script and stills to replace unavailable footage. Last up are the "Original Theatrical Trailer" (3:21, HD) and a "French Trailer" (3:31, SD) that includes alternate shots not seen in the final film. All site content © 2000-2019 Peter Canavese. Page generated at 04/22/2019 03:23:26AM.